Region: This borer is found in the southwestern United States with similar species found elsewhere. Life cycle: This insect produces two generations each year. The larva overwinters in plant roots and pupation takes place in the early spring. Physical Description: The 1 inch long, Caterpillar is a grayish white with dark brown spots that disappear in the winter. The adult moth is tan to yellow and has a wingspan of about 1 1/4 inches. The white to rust colored eggs are flat and lay in overlapping rows on the underside of leaves. 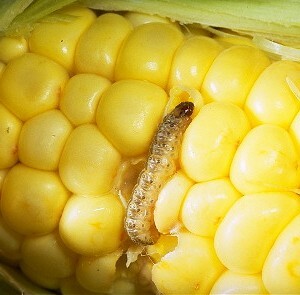 Feeding characteristics: This pest attacks corn by feeding on leaves, cutting holes in the stalks where they pupate. The next generation larvae feed within the stalks and tunnel into the roots where they will hibernate. Controls: Make sure you remove all stubble and debris from the field after harvesting the corn. Cultivate the soil in the late fall. The adult moths may be attracted to daylight-blue lamps. Lady Beetles are a good source to consume borer eggs.